Rolex World of Yachting video above published Mar 27, 2018: Hong Kong plays host to the Rolex China Sea Race. On 28 March, a fleet of first-rate yachts will head out from Victoria Harbour to the final destination of Subic Bay in the Philippines, as part of Asia’s principal blue-water race. The year 2018 marks the 29th edition of the event, organized by the multi-faceted and cosmopolitan Royal Hong Kong Yacht Club. Renowned for its tactical challenges, the 565nm adventure is not for the faint of heart: lumpy seas and a stiff breeze often accompany the early stages, in contrast to the gentle winds that characterize the finish. The Rolex China Sea Race upholds the Corinthian ethos that lies at the heart of Rolex’s enduring relationship with yachting. The 2018 edition of the Rolex China Sea Race got underway at 1120hrs today with blue skies and an easterly breeze of 8kts. T2PTV: Sailing On Demand video published Apr 5, 2018: From the beset shots of the weekend, to sailors' efforts to help keep BVI Strong to locals being recognized for their heroic efforts, the BVI Spring Regatta celebrated it's 47th year in a special way. April Fools' Day from the BVI Spring Regatta & Sailing Festival! Some of the sailors played some pranks over night and awoke to some surprises on their boats. Last day of racing for the fleet. Video above published Mar 31, 2018: From the longest-running BVI vet, to a guy who grew up on this regatta to a lady who started sailing on Tuesday, meet some of the characters of the BVI Spring Regatta & Sailing Festival! Video above published Mar 30, 2018: The Sailing Festival part of the regatta wrapped up with a 'Round Tortola, an Absolut Full Moon Race, and a group of sailors from the regatta helped clean up a beach in Brewer's Bay on the lay day with the BVI Wombles. Friday's race day was big breeze for both the SOL and Norman Circles. Come to Nanny Cay on Tortola in the British Virgin Islands BVI Spring Regatta & Sailing Festival in 2018! Always evolving, this event will add a Full Moon race. 64 islands, one BRILLIANT night! Charter a boat, bring your own, there is a race for every type of sailor over this week of sailing in the Caribbean. The 47th annual BVI Spring Regatta & Sailing Festival will take place between March 26-1 April 2018. Current entries - Results will be posted at bvispringregatta.org. Volvo Ocean Race daily LIVE video above published Apr 6, 2018. Previous 'Daily Live' Shows. Volvo Ocean Race video above published April 4, 2018: Team Brunel won Leg 7 and Dongfeng Race Team placed second, 15 minutes behind, on Tuesday, April 3, 2018. Notes: Vestas 11th Hour Racing dismasted and motored to the Falkland Islands. Sun Hung Kai/Scallywag (gray boat in Pacific Ocean) diverted to Chile following the loss of John Fisher, the Volvo Ocean Race SHK Scallywag sailor who was reported overboard on Monday, March 26, 2018, and is now presumed "lost at sea" (video). Volvo Ocean Race video above published Mar 30, 2018: Conrad Colman gets all the reaction following the fleet's rounding of sailing's most iconic landmark, Cape Horn. Leg 7 Start ...in 115 seconds--Volvo Ocean Race video published Mar 18, 2018--the Leg 7 Start from Auckland. Full replay video here. Leg 7 Started 01:00 UTC March 18, 2018 (9pm EDT March 17th U.S.). See also Leg 7 Start Press Conference video - Auckland | Volvo Ocean Race Mar 16, 2018: The seven Volvo Ocean Race 2017-18 skippers face the world’s media ahead of the Leg 7 start from Auckland. Volvo Ocean Race 2017-18 Leg 7: This is the defining leg of the Volvo Ocean Race, the longest leg of the race--7,600 nautical miles--and most of it is through some of the coldest, roughest ocean in the world. The fleet will leave Auckland on 18 March and head south past New Zealand’s East Cape into the Southern Ocean. Once they get far enough south they will be racing from west to east, sailing within the Westerly Storm Track (low pressure systems circulating west-to east around Antarctica), running with the low pressure systems that prowl around Antarctica. There will be big waves and there will be big breeze. And icebergs. Once across this vast expanse of ocean they will have to negotiate the legendary Cape Horn – where the power of the South Pacific slams into South America – and then turn north, traversing the coast of Argentina, Uruguay and finally Brazil to Itajaí. (source: VolvoOceanRace.com). Day 4 (final day) of Act 1 of the 2018 Extreme Sailing Series in Muscat, Oman, Saturday, March 17, 2018. Next up in the Extreme Sailing Series: GC32 World Championship - Riva del Garda, Italy 24-27 May 2018 - The GC32 World Championship sees the Extreme Sailing Series™ and GC32 Racing Tour fleets combine and provides the second scoring stage of the 2018 Extreme Sailing Series. Day 3 of Act 1 of the 2018 Extreme Sailing Series in Muscat, Oman, Friday, March 16, 2018. Highlights from Day 1 of Act 1 of the 2018 Extreme Sailing Series in Muscat, Oman. Rolex World of Yachting video above published Feb 6, 2018: The Rolex Spirit of Yachting film series presents the 73rd Rolex Sydney Hobart Yacht Race. The behind-the-scenes footage in this 25-minute documentary covers the peak moments of this 628-nautical-mile offshore adventure from Sydney Harbour to Hobart, Tasmania. After a phenomenal contest between Jim Cooney’s LDV Comanche and the Oatley family’s Wild Oats XI, the line honours title for first to finish was eventually attributed to LDV Comanche. The winners of the coveted Rolex timepieces in honour of excellence on the water were awarded to Jim Cooney, who took home the Illingworth Trophy and set a new race record of 1 day, 9 hours, 15 minutes and 24 seconds, and to Matt Allen, who won the Tattersall Cup for overall win aboard Ichi Ban. This moving montage captures the essence of the 2017 edition of one of the world’s most respected and revered offshore races: the Rolex Sydney Hobart. The spectacular footage covers the highlights of the 628-nautical-mile course, from the start out of Sydney Harbour to the setting of a new race record of 1 day, 9 hours, 15 minutes and 24 seconds by Jim Cooney and his all-star crew on LDV Comanche, whose accomplishments earned them the J.H. Illingworth Trophy and a Rolex Timepiece. Rolex World of Yachting video above published Jan 26, 2018. Miami Yacht Show leaving Miami Beach in 2019 after 30 years | Miami Herald: Next year, the Miami Yacht Show moves to Biscayne Bay in Miami between the Venetian and MacArthur causeways, where the former Miami Herald building sat for a half century. The property at One Herald Plaza is now owned by Resorts World Miami and was recently home to a major art fair during Miami Art Week. Watch the Volvo Ocean Race NZ Herald In-Port Race Auckland start action from onboard the boats! Volvo Ocean Race video published Mar 9, 2018: Ever wondered what a Volvo Ocean Race sailor's POV looks like? Wonder no more – here's all the action from the In-Port Race in Auckland, made possible by the Garmin VIRB! Volvo Ocean Race video above published Mar 9, 2018: Watch as the fleet battles out a memorable In-Port Race in the City of Sails featuring a chaotic start, Doldrums-esque conditions and a final sprint to the line! Full Replay here. The next leg, Leg 7, of the Volvo Ocean Race 2017-18, starts from Auckland, New Zealand, on March 18, 2018, and will traverse 7600 nautical miles across the Southern Ocean, rounding Cape Horn, and finish at Itajai, Brazil. Bacardi Cup Invitational Regatta video published March 2018. Video above published Mar 8, 2018. More info: Foiling Week Miami | FoilingWeek.com: 2018 February 15-18 at Shake-A-Leg Miami, located on Miami’s beautiful Biscayne Bay. World Sailing TV video above published Mar 6, 2018: preview of the 2018 Bacardi Cup Invitational Regatta in Miami, USA. 2018 Bacardi Cup Invitational Regatta, March 5-10, is for Star Class sailors and for J70 Class sailors. Miami Sailing Week scheduled for March 7-10, 2018, with four participating one design classes: the Melges 24, A-Cat, M32 and Flying Tiger classes. Volvo Ocean Race video above published Mar 5, 2018: After a global effort to repair the damaged boat, from a team working around the clock to get back to the race, Vestas 11th Hour Racing is back in the water in time for the New Zealand Herald​ In-Port Race – and ready for the Southern Ocean in Leg 7! Volvo Ocean Race (2017-18) Leg 7 starts from Auckland on March 18, 2018. World Sailing TV video above published Feb 28, 2018. RC44 Class Association video published Mar 4, 2018: Lanzarote has delivered outstanding winter racing for this year's RC44 Calero Marinas Cup. From 20+ knots of boat speed blasting downwind in training to champagne sailing in 15 knots for the final day. RC44 Class Association video published Mar 4, 2018: Nico Poons’ Charisma proved today that there is a new player in town in the one design fleet, as they clung on to their lead from yesterday to win the RC44 Calero Marinas Cup, the opening event of the 2018 RC44 championship. But it came down to the last run of today’s last race when a final curved ball cut the Monaco-based team’s overall lead to just one point ahead of arch-rival, Team Nika. After their outstanding Saturday, defending 2017 RC44 champions Igor Lah’s Team CEEREF were still in the groove and led today’s opening race from start to finish. After posting a couple of deep results, Vladimir Prosikhin 's Team Nika was back on song for race two. The Russian team and John Bassadone’s Peninsula Petroleum opted early for the right on the first beat where they struck gold. The two boats were respectively first and second at the top mark, positions they maintained until the finish. UPDATE Mar 4, 2018: Charisma held a five points advantage over Team Nika, with Artemis Racing a further three points back going into the final day of racing on Sunday. Charisma held on to win.the RC44 Calero Marinas Cup 2018 on Sunday, a well-deserved win for Nico Poons, Ray Davies and the entire crew after a week-long battle with Team Nika. Next RC44 event: RC44 Portorož Cup, May 9-13, 2018. RC44 Class Association video published Mar 3, 2018: A North Atlantic cold front, threatening to wreak havoc over Lanzarote, provided Solent-like conditions for the opening race on day three of the RC44 Calero Marinas Cup, the first event of the 2018 RC44 championship. Fortunately, once the front had passed, the wind veered back into the south, the sun came out allowing all the teams to enjoy another memorable afternoon of racing. RC44 Class Association video above published Mar 2, 2018: Lanzarote laid on superb conditions for day two of the RC44 Calero Marinas Cup under brilliant sunshine and winds that started in the sub-10 range before building solidly into the 20s, making for a spectacular action-packed third and final race. Torbjörn Törnqvist’s Artemis Racing claimed the opening race after tactician Andy Horton correctly called the favourable left side of the course, just as he did in yesterday’s first race. Conditions had built for race two which turned into a heavyweight bout between Vladimir Prosikhin’s Team Nika and Nico Poons’ Charisma. Nika led around the first lap but Charisma had edged ahead by the end of the second beat and maintained their lead to the finish. Pundits noted that the match racing between the two boats may have been fuelled by some rivalry between the tacticians– former Emirates Team New Zealand skipper Dean Barker calling the shots on Team Nika and his former tactician Ray Davies in this position on Charisma. RC44ClassAssociation video above published Mar 1, 2018: The opening day of the 2018 RC44 Calero Marinas Cup indicated firstly how close the season for the Russell Coutts-inspired one designs is set to be and how to win, it will be vital to make zero mistakes. Three races saw three different winners. Torbjörn Törnqvist and Artemis Racing romped away to claim race one. Next up it was the turn of Vladimir Prosikhin’s Team Nika to take race two. This left the sole Russian team now competing on the RC44 circuit ahead overall going into the final race. Sadly, while they were second at the first top mark rounding on the transom of John Bassadone’s Peninsula Petroleum, a ripped gennaker put paid to Team Nika’s chances and lost her the overall lead at the close of play on this opening day to Peninsula Petroleum. RC44 Class Association video above published Mar 2, 2018: The key to success in the RC44 fleet is flawless crew work. We talk to Charisma owner Nico Poons and tactician Ray Davies to find out how it's done. 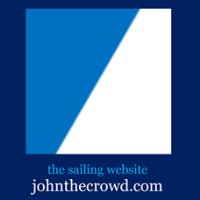 See also: "Introducing the CEEREF's Black Hawk (video), "The world's best sailors are back on the RC44 race track" video and Welcome to the RC44 family (video)--friends onshore, rivals on the water. The five event 2018 RC44 Championship begins where it left off in 2017 - in the Calero family’s Marina Lanzarote, in Arrecife in the Canary Islands. The RC44 Calero Marinas Cup will take place 28 February (practice day) until 4 March.